Although my last official day of university (ever!) was this past Monday, I opted to skip it for background work on the set of a new mini-series they are filming here in Alberta. It’s called Klondike, appropriately named as it’s about the Klondike Gold Rush that took place in the Yukon in the late 1890s. The point of this post isn’t so much the mini-series, but rather one funny encounter I had with a fellow extra. If you watch Game of Thrones you’ll recognise him! He plays the character Robb Stark. So anyways, I’m standing on set as the crew and the above actor prep for the scene. There are a number of us extras standing around waiting in the mud and snow. We’re dressed in our 1890s costumes, complete with terrible constricting shoes which suffocate the toes and provide zero protection against the cold. Actually, I think most of the guys had pretty adequate shoes, but the ladies… not so much. No idea how women managed to keep their toes back then. There were a number of times I was worried mine might fall off, and I even had those foot warmers surrounding my feet like armour (not that they did anything). Anyways, I’m digressing. Him: Hey have you ever seen Game of Thrones? Me: Yeah, I’ve seen it a few times. Him: Look at that guy. 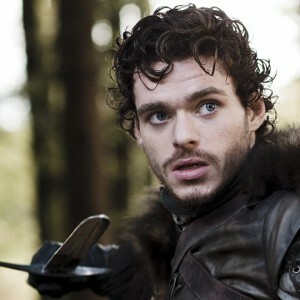 He looks exactly like Robb Stark! Immediately after he says this the biggest grin washes across my face and I start laughing. Me: Are you joking right now? Him: No, why? You don’t think so? Me: Well, of course I think so. Because he is Robb Stark. Him: It’s the same actor? I nod and the obviousness of reality smooths over his face, comprehension dawning. That’s my story. I best get back to packing up now. Did I mention that Liam and I are moving very soon (next week!) into a house of our very own? Quite excited! But am finding the task of packing up my entire life very daunting. So much stuff to go through and I feel like having a nap just thinking about it. Nothing like a house of one’s own. Very exciting! Hope you have a great day, too!